There’s only one thing I love more than blood orange season and that just happens to be baking with olive oil! I figured what could be better than combining the two into the ultimate vegan chocolate cake with a citrus twist. This Vegan Blood Orange Chocolate Olive Oil Cake should officially be on your baking “to-do” list before citrus season ends! I have a Confession- I am Obsessed with Olive Oil Cakes! The other night I was at my friend’s birthday party and some girlfriends asked me what my absolute favorite recipe is on the blog. To my surprise, I blurted out, “My Vegan Grapefruit Olive Oil Cake. Oh, but it’s tied with my Vegan Lemon Olive Oil Cupcakes“. To some of you reading this, this might sound like a normal response. 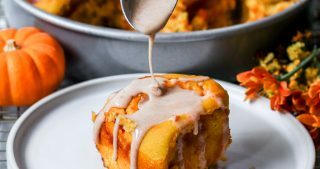 However, as someone who prides myself on my vegan bun-making skills (I mean hello these Vegan Cranberry Orange Sticky Buns are always a top recipe on the blog), this was a shock to me. So…I think it’s time to tell you another confession. Before I started baking vegan, I never really LOVED store-bought cake. Here’s the thing. I find a lot of cake, even from the best of bakeries, can go one of two unideal ways; super dry and not at all flavorful or too dense where all I can taste is butter. Now, there are exceptions to this rule. For example, back when I could eat eggs, going to the Wandering Goose and getting a slice of their cake was ALWAYS a good idea. Plus, Wegmans cakes never let me down. I’m sure there are a few other places, but the moral of the story is that store bought cake is truly hit or miss for me. I’m not trying to complain, but all of this is to get to WHY I love vegan olive oil cakes so much. It really comes down to the dreaded “m” word….moist! This Vegan Blood Orange Chocolate Olive Oil Cake is SO MOIST! Plus, this olive oil cake is incredibly light and tender too. Using olive oil instead of butter lets the flavor of the blood orange and chocolate truly shine through. Regardless of your thoughts on the word moist, I am here to tell you that this Vegan Blood Orange Chocolate Olive Oil Cake will not disappoint. Actually, scratch that. I am here to tell you that any recipe made with olive oil on this site will NOT disappoint! The most fun part of baking a cake is decorating it! I actually tried this Vegan Blood Orange Chocolate Olive Oil Cake with two different toppings and loved it both ways. I included the recipe for vegan blood orange frosting below so go check it out if you choose this option! If you do go this route, definitely make sure you have both shortening and vegan butter on hand. Palm Oil, which is what most vegan shortening is made of, creates a much smoother frosting. Also, that 1/2 Tbsp of coconut cream will make your frosting SO fluffy so don’t skip it! Though I don’t have the cake with the glaze pictured in this post, it’s just as delicious as frosting. I would argue it has even more blood orange flavor than the vegan frosting. To make this glaze, simply whisk together 1/2 cup powdered sugar, 1 Tbsp blood orange juice, and 1 tsp blood orange zest until a thick but smooth glaze forms. Pour on the cake when cooled and enjoy! Top your cake with candied blood oranges! Here’s a recipe you can follow for Easy Candied Blood Oranges. To be honest, I never follow a recipe when I candy fruit. It’s just a matter of adding equal parts sugar and water to a pan, dissolving the sugar, and then simmering the fruit until the outer edge is translucent and the syrup is thick. Then, just make sure you let your oranges air dry overnight. To make the perfect candied oranges I make sure to do two things. One, don’t overcrowd the pan. Two, don’t overcook the oranges or they get super stiff. I have found that 45 minutes is usually more than enough time for the citrus to simmer in the pan for great results and always flip half-way through! Top your cake with dehydrated citrus! Last- Top your Cake with Fresh Flowers! Any will do, but if I had my pick ranunculus would be at the top! If you’re unsure what to do, Karlee at Olive and Artisan has an awesome blog post about How To Decorate Your Cake with Flowers that I love. Before we are done, I want to leave you with a few notes that I found useful when making this cake. The Olive Oil you use DOES matter. High-quality olive oil will lead to a better crumb, texture, and flavorful cake. The cocoa powder you use in this recipe is super important too. Pleaseeee- NO Hershey’s or cocoa powder with sugar added. Just good quality cocoa powder does the trick. There is a lot of information out there on the sustainability of Palm oil. I try to use this ingredient sparingly in my recipes because of it’s tie to rainforest destruction. When I do buy palm oil, I buy Spectrum Organics. Though I’m not an expert, through my research I have found them to be the most sustainable option. Make sure to sift together your dry ingredients. I know a lot of recipes call for this and you’re probably like, BUT WHY. Skip….! Well, this time I’m telling you not to. Cocoa powder easily clumps together with moisture and no one wants clumps of bitter cocoa in their cake. To get the most out of your blood oranges, use a citrus juicer. I’ve found that I can usually get away with squeezing lemons with my hand, but that’s not the case with oranges. A juicer is really necessary to get the most out of blood oranges! Hopefully, these tips are helpful, but if you ever have any questions please comment below and I will answer you ASAP! I hope you are as excited as I am to bake this Vegan Blood Orange Chocolate Olive Oil Cake. If anything, I hope that the recipes on this site give you a deeper appreciation for the magic of olive oil in baking. When the time comes to make a cake and you’re short on butter, just know if you have olive oil on hand you’ll be set to make the absolute best Vegan Olive Oil Cake! Preheat oven to 350F. Lightly grease an 8 or 9-inch spring-form pan and set aside. In a large mixing bowl sift together your dry ingredients including your cake/pastry flour, cocoa powder, salt, baking powder, baking soda, and espresso. Set the bowl aside. In a separate mixing bowl, whisk together your almond milk, olive oil, sugar, blood orange juice, vanilla bean paste/extract, and orange zest. Once evenly mixed, slowly incorporate the bowl of sifted dry ingredients until a smooth cake batter is formed. Add the batter to the greased spring-form pan. Before putting the pan into the oven, tap the cake pan on the counter to release any large bubbles. Add to the oven and bake for 40-45 minutes until a toothpick comes out clean when inserted into the middle. While the cake is cooling, make the frosting. Start by whipping together your vegan butter and shortening until smooth. Then add in the vanilla bean paste/extract, blood orange juice, and coconut cream and whip for another 30 seconds. Finally, begin to gradually add the powdered sugar until no clumps remain and the frosting is smooth. Top your cooled cake with the blood orange frosting and use a spatula to smooth. Slice into 8 even pieces and enjoy!